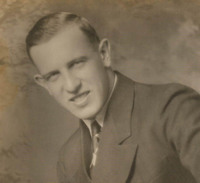 A graduate member of the Tomahawk High School Class of 1928, participating in football and basketball all four years. This was the maximum participation allowed at the time. Paul “Peck” Bebeau was one of those magical players who was loved and respected by his classmates, teammates, and opponents. His positive attitude and athletic talent left him extremely popular with everyone in the Tomahawk community. As a senior, he was captain of the football team, having a knack for avoiding injury. Team plays were often developed around him. As good as he was in football; it was in basketball that he excelled. Some of his individual honors were leading the team in scoring as a junior with 154 points and being selected as first team All Conference his senior year. Paul’s four years playing basketball for Tomahawk High School also saw him as an important part of some results that have not been duplicated since, considering that Tomahawk played teams from the Wisconsin Valley such as Rhinelander, Merrill, Wausau, Antigo, Wisconsin Rapids, and Stevens Point. During that time Tomahawk was impressive with a record of 53-18 playing against these larger schools. Paul’s impact in basketball was felt all four years. In 1926, Tomahawk made the state tournament in basketball, was one game away from returning to state in 1927 and won the Wisconsin Valley basketball title in the 1927-28 season. After high school, Paul’s ambition was to play ball in college. He entered Oshkosh Normal School but returned home to work and save enough to enter UW-Madison where he hoped to play football for Glenn Thistlethwaite. But on January 23, 1930, 20 year old Paul’s dreams vanished when he was in a fatal accident while working for Moe & Bronsted, a local ice dealer, in the annual ice harvest on the Wisconsin River. Paul’s funeral was attended by a standing room only crowd. His family received letters from W.P. Boyle, Superintendent of Schools; Lloyd Bohm, High School athletic coach; William Ball, manager of the Frigidaire basketball team; Coach Glenn Thistlethwaite; along with the managers of the Park Falls & Tigerton local basketball teams and others.